This Bach Flower Remedy is an effective treatment for individuals stuck in the kind of dull, one-sided routine that results in intellectual weariness and exhaustion. Your first image might be that of a factory worker, doing the same thing over and over. But it can also apply to office workers, and even executives who have the same kinds of problems and issues to deal with from day to day. Even those whose work revolves around running a household, attending charity events, or volunteering for a cause can become so stuck in routine that life loses its luster. This is the person who is out of touch with the impulses of the Higher Self - turning a deaf ear to its messages and preferring to stay in a familiar, routine pattern, even while it is unsatisfactory. He or she ignores opportunities for development on any but the mental plane, and thus misses out on many of the things that make life worth living. Because energy is not exchanged between the planes, energy deficits occur - making the sufferer as if life has become a burden rather than a joy. Mornings hold no anticipation of the day to come. Interestingly, the Hornbeam personality can be jogged out of its weariness when something unusual happens that challenges the person at a different level. Mental challenge can be the way out of the mental rut. Sensitives describe treatment with this Bach flower essence as refreshing - like taking a cool shower that revives body and spirit. After treatment with Hornbeam, the individual rediscovers the correct way to alternate between activity and passivity. Life and work once again are pleasurable and the individual knows that he has the strength to achieve his desires. Some fall into the negative Hornbeam state through the routine of work and daily life, some through intense study for long periods of time, and some through confinement because of a long illness. Hornbeam is one Bach Flower Essence that is usually needed in combination with other flower essences, such as Olive, Gentian, or White Chestnut. 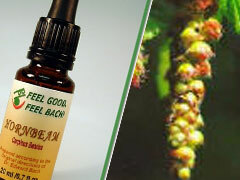 As a compress, Hornbeam can be used to soothe tired, irritated eyes, and to strengthen varicose veins. The tonic effect - the cool, refreshing shower - is often helpful in getting individuals successfully through drug rehabilitation. Gardeners often choose this Bach flower essences, along with others, to give new vigour to limp plants. © 2015 BachFlower.org All rights reserved.